Tonight I'm tickled to show you a few glitter mixes from the indie polish company, Loaded Lacquer. After seeing the beautiful work over at Chit Chat Nails, I immediately went online and bought myself the same mix. (The amount of inspiration I draw from Chit Chat Nails is really quite large, so please go check her out if you haven't already!) Then Heather, the lovely owner over at Loaded, contacted me to try and review a few more. First, check out the nail art I did with one of the shades reviewed below, Fluffy Macaroons. The colors besides Fluffy Macaroons I used were On Cloud 9 and Enlightenment (Precision Nail Lacquer), Bottoms Up (China Glaze) and Blue Sky's the Limit (Sation). I loved picking out the colors that went so well with the glitter. 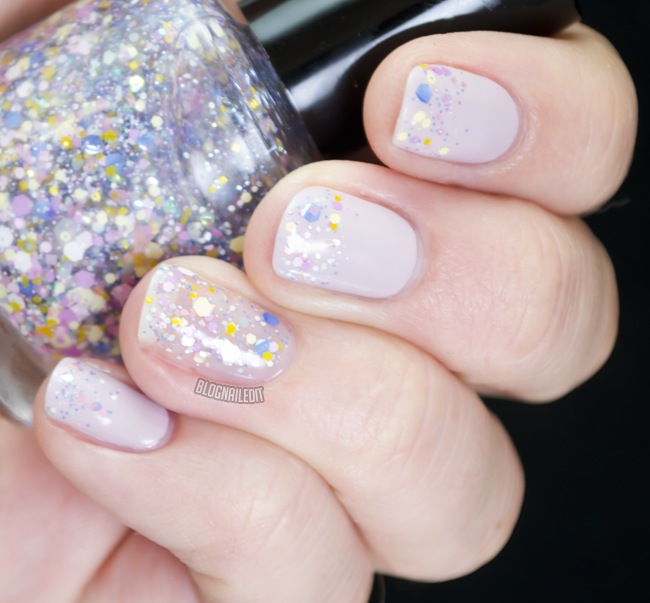 Fluffy Macaroons is such a girly, perfectly Easter glitter mix of pinks, blues, yellows and some iridescent pieces. Here I'm showing it over Steady as She Rose (OPI). Moonshine in a Jar is the amazing color I was inspired to buy Loaded Lacquer for originally. Shown over Chantal (Zoya), the mix is gold and copper, and it's very dense! The ring finger is literally two coats! The last polish shown today is Steampunked (shown over I'm So Ogre It from Sation). The colors are perfect for the name - copper, gold, black and silver. Just as cogs, gears and all manner of metal trinkets make up the revived steampunk style, so too does the variety of shapes in this polish - square, hexagonal, bar, and even some large circles. It's a little difficult to work with, so you need to apply with a dotting motion. Loaded Lacquer has plenty of other amazing mixes to choose from, all available from the Loaded Lacquer store. I highly recommend these as toppers to spruce up the most boring manicure in the most exciting way! Thank you Heather for the beautiful polishes to try! These products were sent to me by Loaded Lacquer. The reviews are based entirely on my experience with the products and were in no way influenced by anyone. Super cute :) I love that Fluffy Macaroons glitter! I love loaded lacquer! I have steampunked, captain obvious, oxygen bar, mintallica and toasted marshmallow.I just love Heather's glitters. I need to get more of the jiggles! The formula is just awesome & perfect for creating sandwiches! 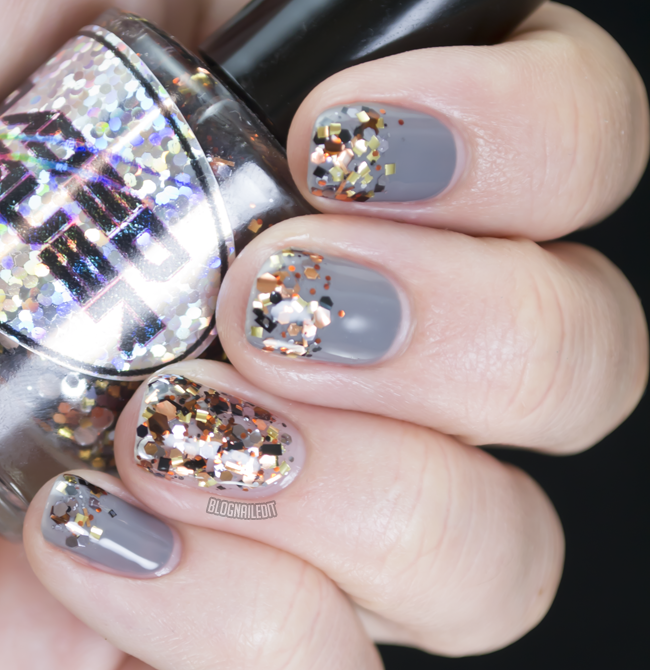 These are really pretty glitters! I especially love Fluffy Macaroons and Moonshine In A Jar.